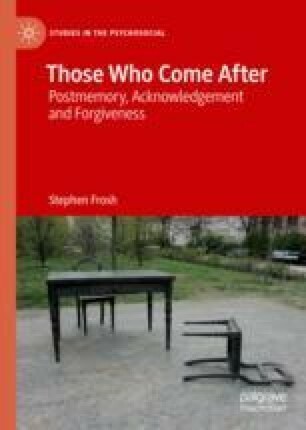 A central question that this book has worked on is that of what it might mean to remember something one was not part of, to memorialise an event or experience that happened to others with whom one might not be linked through ties of family or friendship – or even not linked in any ‘objective’ way, but simply through an act of imaginative identification. Mostly, the previous chapters have taken this up in its ‘negative’ forms, either (as in the second generation experience) in relation to the difficulty of separating oneself from an overwhelmingly traumatic transgenerational heritage, or because of the disturbing effect of the sense of a felt culpability for something that was not in fact one’s responsibility, yet which one is implicated in by virtue of one’s position in a particular place or time. This is, for instance, the culpability that might be felt and acknowledged by those who ‘come after’, as in the responsibility some British people feel for colonialism and slavery, or some Germans for the actions of their Nazi forbears – even if their actual forbears were not Nazis. Alternatively, there is the kind of traumatised identification that can be made with those who have suffered, even if one has not suffered in the same way oneself. The horrified identification that people can have with parents who have lost children is an example of this, and it might even be the case that certain ‘empathic’ identifications leading to charitable giving and social action depend upon the capacity of people to identify with and take responsibility for suffering that they themselves may have had no direct experience of (Seu 2013). BBC. (2011). Steve Reich’s Different Trains. http://www.bbc.co.uk/programmes/p02r9p32. Accessed 2 Jan 2019. BBC. (2014). Steve Reich Talks to Stuart Maconie. https://www.bbc.co.uk/music/artists/a3031680-c359-458f-a641-70ccbaec6a74#p024cght. Accessed 2 Jan 2019. Haydock, N. (n.d.). Different Trains – Steve Reich. http://www.haydockmusic.com/music_essays/steve_reich_different_trains_part_one.html. Accessed 17 Aug 2016.